Leto was once amongst the most highly regarded deities of Ancient Greece, although today her name is not amongst the best known of the Greek pantheon. 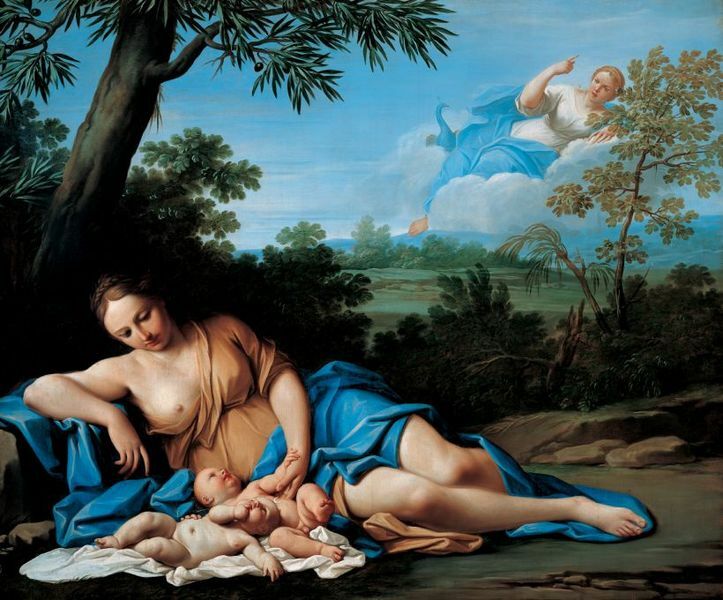 Leto was the Greek goddess of motherhood and modesty, but the reverence that she was once held in is primarily due to the fact that Leto was the mother of two important deities, Apollo and Artemis. Leto was regarded as a second generation Titan, for the Greek goddess was the daughter of Coeus and Phoebe, who were first generation Titans. Coeus and Phoebe were also parents to Asteria and Lelantos. Leto could be regarded as a contemporary of Zeus, for Zeus whilst called an Olympian, was also born to first generation Titans; in his case Cronus and Rhea. Coeus and Phoebe would lose their prominent status when Zeus overthrew the rule of his father, and the other Titans during the Titanomachy, but as Leto had not taken sides during the ten year war, she was allowed afterwards to live freely. The freedom given to her, perhaps also had something to do with her beauty; for Zeus was certainly enamoured by the beauty of his cousin. Despite being said to be married to Hera at this time, Zeus acted upon his impulses, seducing and sleeping with Leto. Inevitably, Leto would become pregnant by Zeus. Hera found out about the pregnancy of Leto before the goddess could give birth, and Hera promptly set about trying to prevent her husband’s mistress from giving birth. Hera warned all land and water that they should not give sanctuary to Leto, preventing the goddess from giving birth. Hera also covered the earth in cloud, hiding from Eileithyia, the Greek goddess of childbirth, the fact that her services were required. Hera also decided to harass Leto further, and employed the Python, the monstrous offspring of Gaia, to chase after Leto, giving the goddess no respite from her labour pains. Leto would be chased across the ancient world, but eventually Leto came to the floating island of Delos, and the island agreed to give sanctuary to Leto, for Leto promised to transform it into a great island. Delos was not, at the time, considered to be land nor water, and so was not specifically going against Hera’s proclamation, but when Leto touched it the floating island of Delos became connected to the ocean floor so that it no longer floated. At the same time, what had been a barren island, was metamorphosed into an island paradise. In Greek mythology there is an additional reason why Delos gave sanctuary to Leto, for the island was also named Ortygia and Asteria, and was the transformed form of Asteria, the sister of Leto. Asteria having been transformed to escape the lustful advances of Zeus previously. Let though had a safe place in which to give birth, and Leto quickly gave birth to a daughter, who of course was Artemis, the Greek goddess of the hunt, but Artemis was not the only child Leto was pregnant with, for the birth of Artemis’ twin was imminent. Artemis was said to have assisted Leto with the delivering of her own twin, but for nine days and nights, no baby appeared. Eventually though, Eileithyia discovered that her services were required, and she arrived on Delos, and soon a son was born to Leto, the Greek god Apollo. 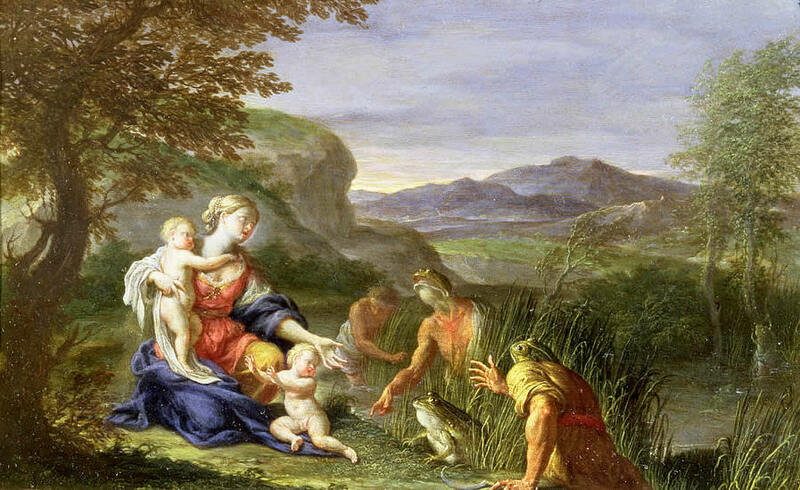 It is probable that it was only after the birth of Apollo and Artemis that Leto became regarded as the Greek goddess of motherhood. The new-born Apollo would have his revenge on the monster that had harassed Leto, for when only three days old, Apollo obtained a bow and arrows made by Hephaestus, and killed the Python, and in doing so became the premier deity of Delphi. Later, Leto herself would travel to Delphi, but it proved to be a dangerous road for the goddess to take, for upon the road was Tityos, the gigantic son of Zeus and Elara. Tityos would attempt to abduct Leto, perhaps at the urging of Hera. Before Leto could be carried away though, the sound of the stuggle between goddess and giant was heard by Artemis and Apollo, who rushed to their mother’s aide. For attempting to abduct Leto, Tityos would be punished in Tartarus, for two vultures would feed upon his liver as he laid outstretched on the ground. Leto is a prominent figure in the story of Niobe, the daughter of Tantalus, for when Niobe was queen of Thebes, she would rashly boast that she was a better mother than Leto; for Leto had given birth to just two children, whilst Niobe had seven sons and seven daughters. In some versions of the myth, Leto was so affronted by the boast of the mortal queen that she called forth her own children to avenge her. Thus, Apollo and Artemis came to Thebes, and Apollo would kill the sons of Niobe, and Artemis the daughters. Only one daughter would survive, Chloris, for this daughter had prayed to Leto. Leto would become closely associated with the region of Lycia, and indeed, Lycia was said to be the home of the goddess. 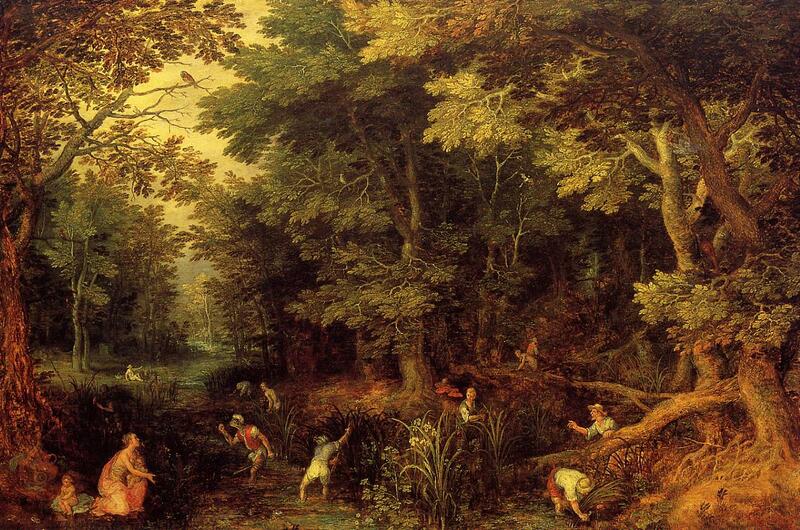 Ovid, in the Metamorphoses, tells of the arrival of Leto in Lycia, shortly after the birth of Apollo and Artemis. Wishing to cleanse herself in a local spring, Leto came to the water’s edge. Before Leto could bathe in the waters, some Lycian peasants arrived, and drove the goddess off, for the Lycian peasants had cattle that they wished drink from the spring. Some wolves would subsequently guide Leto the cleansing waters of the River Xanthus, and once refreshed, Leto returned to the spring, and their turned the peasants into frogs, frogs which forever would need to remain in the water. ​During the Trojan War Leto was said to be allied to the Trojan cause, just as Apollo and Artemis were. Leto did of course have a close association with Lycia, and Lycia was an ally of Troy during the war. It was even said that Leto faced off against Hermes upon the battlefield at Troy. Arguably more importantly at Troy, Leto was responsible for healing the wounds of Aeneas after Apollo had rescued the Trojan defender. Leto is also mentioned in passing in the story of Orion, for Leto was said to be a companion of her daughter Artemis when she hunted. Leto also pleaded for clemency for Apollo when Zeus threatened to throw him into Tartarus, after Apollo had killed the Cyclopes.